Risk. Until the summer of last year financial institutions couldn’t seem to get enough of it. Be careful what you wish for. Because the financial markets are still struggling to come to terms with the explosion which too much risk has caused. The financial institutions involved in this debacle are trying to dig themselves out of the rubble. Losses of around $400bn seem certain and long term, whole swathes of business are now off limits. Job cuts are far bigger than anyone would guess from looking at the media because firms are trying to keep them quiet. Big investment banks are cutting between 15 and 25% of their staffs, systematically wiping out whole departments which they spent much time and money assembling. The scale is much bigger than in previous crises. The regulators are still trying to find out how it happened and why they failed to stop it. Central banks are still struggling to work out the impact on the economy and what this means for future policy. They have already had to jettison much of the intellectual framework they built up in recent years. How much more has to go? Aren’t they just fuelling the next crisis by trying to handle this one? There is a lot of talk about changing the way the industry works, some sincere, rather like the man who has had a heart attack vowing a healthier life style. But you don’t know if he really means it until next time the ice cream comes round. To a much greater extent than in previous crises, the financial industry itself has gone in for introspection on what went wrong. There is a reason for this. Shareholders in banks and investment banks have lost lots of money and they want to know why. It’s a bit like the comparison sometimes made between medicine, where mistakes on the operating table kill the patient but not the doctor; and airlines, where the pilot gets killed as well. Airlines spend a lot of money on safety. The pilots make sure of that. Some remarkable autopsies have come out of the industry as firms try to explain write-offs. One common characteristic is that the losses often seem to come in obscure instruments with initials no one outside a small part of the market had every heard of. Thus a very senior Citigroup banker had never heard of the now notorious Constant Proportion Debt Obligations* which cost his bank so much money. Very few people in the higher reaches of UBS knew anything about the ABS index until they learned that bets on which it depended had wiped out a large part of their capital. Financial innovation has been so rapid that people at the top could not keep up. There’s a reason for this. Banks and investment banks have grown dramatically in the past decade, far faster than the underlying stock of money which they handle. They have done this without getting enormous injections of capital either by using complex structures which leverage assets and using the derivatives market to handle them. Over the three years to mid 2007, the scale of the market in derivatives issued by financial firms grew 33% a year to reach $510 trillion. That sort of growth opened opportunities for new exotica to flourish. The two themes which stood out were these. The aim was to take a basic asset, like a bond or a share and split up the various components which could then be repackaged. So split the capital repayment and the interest on a bond and you now have two things to sell instead of one. The U.S. subprime crisis didn’t happen overnight, and a number of events contributed to its contagion effect on global credit markets. Below, the ten-year Treasury note – a key safe-haven for risk-averse investors – illustrates the subprime timeline. Mar 27: Bernanke: Subprime impact on economy & financial markets “likely to be contained” Contained? The other common feature was that many of the innovations were designed to ease the burden of capital constraints which the regulators wanted to impose to make the firms safe. The CPDO * phenomenon was one example. Typically, CPDO’s paid 2% above the going rate of interest yet they were rated AAA by the ratings agencies, which allowed banks to say they weren’t taking risk by buying them. For other instruments there was an even better way forward. Banks could set up Structured Investment Vehicles, stuff them full of risky bonds and announce they were now off the balance sheet. When losses in their portfolio started making these SIV’s less attractive, the SIV-Lite was invented using more leverage. These SIV’s were amongst the first things to cause trouble because people began to ask awkward questions about how they got the money to buy the bonds and whether they would be able to repay it. Many have been quietly wound up, the bonds taken back onto the books and the losses absorbed. After the first wave of concern in August, many thought things had been solved. Equities rallied sharply for a month. But in the credit markets where the crisis started things did not improve. In fact they got worse as people started looking at the bonds they had bought and reading the label explaining just what was in them. From mid-September to mid-March, the story was of Central Banks feeling paralysed from bailing the market out because of the problem of Moral Hazard. This is that if Central Banks bail people out every time they lose money, there is no incentive to take precautions not to lose money. The current compromise which emerged in the wake of the Bear Stearns bail-out is an uneasy one. All the clients who lent money were protected but the shareholders lost almost all of their money. This isn’t really viable as a long term solution. It still allows firms to gamble everything on a throw of the dice and getting the casino to lend them the money to do it. Because whatever happens, the casino knows the loan is guaranteed. The hidden assumption in financial markets has been that if things go wrong the first body carried out will be a firm big enough to notice but small enough to leave to its fate. That would make everyone more careful and avoid the authorities having to decide about whether to bail out a firm which was big that it could be allowed to fail. Unfortunately, herd behaviour in markets is now so strong that everyone loses money at the same time. The miner collapses at the moment the canary stops singing. Central Banks are just going to have to admit that the system cannot afford a failure. They can try to be more diligent in preventing them but if they come along they don’t really have a choice as the Fed found in mid-March. One change which happened as part of the Bear bailout will last and is important. This is that regulators have admitted that in the modern world there is no difference between a commercial bank like JP Morgan and an investment bank like Morgan Stanley. That distinction was at the heart of the 1930’s attempt to handle a banking crisis. Over the past decade the legal difference has been wiped out but the regulatory rules had stayed unchanged, with the Fed regulating banks in the US and promising them funding when they needed it but making no such promise to investment banks. It was the investment banks which most needed a bail-out so they are now in the same funding system and will get drawn into a similar regulatory arrangement. Don’t rely on that to avoid crises. Some banks did just as badly as investment banks. And if they want to, banks can quite legally run rings around the regulations which are made. Regulators need people to want to be regulated. How did a financial market which employs some of the cleverest people in the world get into the mess it’s in? The deep cuts in interest rates which the US used to get out of recession made leaving money in the bank an unattractive option. So investors started looking for ways to take advantage of the return of growth by investing in the things which do well when the world does well. 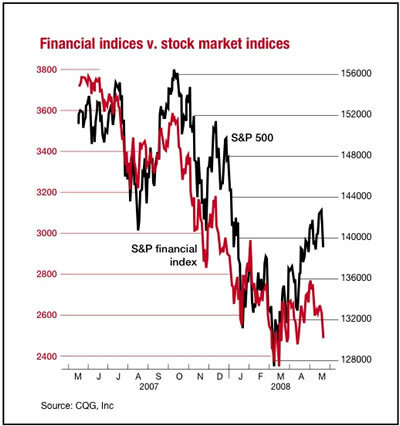 For years the markets had been over-cautious on many assets, fearing problems which never came. Now the things which had been shunned became the fashion again. THE big puzzle in 2006 and the first half of 2007 was the puzzle of risk. Central banks murmured that they were surprised people were taking so much risk and asking so little for it. It was, however, not for them to tell people what to do with their money so they restricted themselves to murmurs. After all, the large institutions had huge risk management departments who specialised in issues like this. The economy needed the help of low interest rates and apart from raising interest rates there was nothing the central banks could do without interfering in the market. Banks were regulated so that they could survive if things went wrong. Everybody else would just have to watch out for themselves. Within the big institutions, computers toiled ceaselessly to analyse the potential dangers of the positions which firms held. Their well-established rules allowed risk departments to say that if things went wrong there was a 99% chance the loss would be no more than x million dollars and a 95% probability that it would be no more than y billions, both figures which could be absorbed if necessary. The rules came from analysing what had happened in the past, looking at how often certain things happen and converting this into handy ways of thinking about risk. A loss above a certain level would be a “once every 10 years” event. Through 2006 and the early part of last year, something odd was happening. The rush into risk continued, but there were occasional flutters. Events which should only happen once every 10 years seemed to happen once every 10 days. Since many of the events involved making big profits rather than big losses, this was treated as an interesting observation rather than a warning signal. The strength and weakness of Taleb’s argument goes right to the heart of one of the big questions facing the financial market now, which is how to handle risk in the light of the past year’s trauma. Sadly, deciding what to do requires a bit of statistical theory. Conventional risk management expects events to fit into the sort of bell-shaped distribution discovered by Gauss. This is like the classic chart of the height of the population, with a lot of people around the average and very few at the extreme tails. But there’s another kind of distribution which is more uncomfortable. This was worked out by the French mathematician Poisson, who dug into the incredibly precise medical records of the Prussian army to find out how many soldiers were kicked to death by a horse while they were clearing out the stable. (He chose this because he wanted something which didn’t happen often and only the Prussian army would record such detail about anything.) He found that this happened more often than you might think. If you try to convert his evidence to fit the bell curve of Gauss’s theory, you find that the “tails” at either extreme are bigger or fatter than you would expect. This is both a very important and a profoundly useless bit of information for financiers, as it was for the Prussian army. Because financiers need to take risk in the same way that the Prussian army needed to have horses. And most of the time taking risk is not only a reasonable bet, just as insuring a house is a reasonable bet even though houses sometimes burn down. Indeed not taking risk can lead to being overtaken and taken over by those who do. Most people who drive at 100mph on the open road with the roof down enjoy the experience and those who don’t usually don’t get to tell us. The price of risky assets soared. Banks happily lent money for people to buy more risky assets. When those assets went up again they became collateral for a new round of buying. Hedge funds grew apace, offering high rewards with expertise in choosing what to buy. Most notably, money poured into lending to people to buy houses. Any people. Any houses. Can’t afford the repayments? No problem, just pay the interest until you can. Can’t afford the interest either? No problem? Just pay 3% for the next couple of years. By then you’ll be able to sell at a profit. Still can’t afford it? We don’t need to say you only earn $15,000 a year. The bank doesn’t need proof you’ve got a job. Just sign the form saying you have. Can’t afford to do it because there is no money to buy the furniture? We’ll lend you more than the house costs so you’ve got some left over. It’s a measure of the extraordinary inventiveness of the financial industry that it can take housing, thought of as the benchmark of stability (“safe as houses,”) and turn it into high risk financial products. The classic conditions for a bubble were in place, though the more euphemistic term “feedback loop” was usually preferred. House prices soared. Financial institutions made record profits. The house bubble was biggest in the US but was world wide. The risk bubble went wider than housing. Private equity firms noticed that companies had got rid of their debt during the recession. The private equity boom came from offering shareholders a higher price for the shares and then loading up with debt the company which had been taken over. Banks and investment banks formed long lines waiting for the chance to provide the money. Leverage grew in the hedge fund industry. Instead of buying assets worth 3 or 4 times the amount invested in them they went up 7 or 8 times. Ratings agencies joyfully added to the party. They get paid by the people they rate. It’s no doubt pure coincidence that many structures which contained obviously junk assets mixed in with the rest were given AAA ratings by the agencies which sometimes helped design them. And then the bubble popped. The US Federal Reserve raised interest rates, making the margin between what banks paid and what they received smaller. House prices stopped rising and then began to fall a little in parts of the US. That didn’t have much impact at first. Mortgage lending stopped rising, but that just made the frenzy to find things which offered a risk premium even more intense. Stories abounded of private equity loans being offered on absurdly generous loans by banks which needed to fill their quota. But last summer, banks began to find it harder to get funding for their activities. Gently at first, but then with increasing pace, they found that the loan which was rolled over every 3 months at even lower interest rates had become more expensive the next time they renewed it. And the time after that it wasn’t available at all. Some of the bonds they owned fell sharply in price. Initially it was just bonds backed by very risky low quality mortgages. When they tried to limit their losses nobody wanted to buy. Others in the same position were trying to sell. There were literally no buyers. The traditional market rule “there’s a price for everything” wasn’t true any more. Forced to sell something to limit their risk, they started selling some of the better stuff, driving the price of that down next. Liquidity became harder to get. No one was too worried because they were confident that the assets they owned were more than enough to cover their liabilities so there was no problem of solvency. But they cut back on lending. And began to wonder whether maybe the other fellow might have bigger problems than them so they ought to stop lending to him. Bear’s collapse forced the Fed to answer one question of crucial importance for shaping the future? Did the central banks really mean it when they said they would not interfere with asset prices on the way up or the way down? The answer was a resounding no. It’s because the markets believe there is no going back on this commitment that we have seen a recovery since the middle of March. Longer term the authorities have a choice between two approaches. They can accept that the big financial institutions are too big to fail and look at ways to make them safer though better regulation; or they can accept that failure is a necessary part of markets and design those markets so that they can withstand the collapse of one without the collapse of all. Both are harder to do than to wish. The financial industry responds to regulations by inventing ways round them. Rules designed to force public disclosure of liabilities result in complex structures to conceal them. The end result is that the financial instructions themselves do not really know what they are doing. At least the Mafia keeps a secret set of books for itself so it knows how the money is really moving. A classic example of the limits of regulation came fairly early in the process. It explains why regulated banks have been just as likely to get caught in the mess as the less-regulated investment banks. Bank regulation works mostly through constraints imposed on a bank’s balance sheet, the list of assets and obligations it holds. But when many bonds went sour last year, it was discovered that they weren’t actually on the balance sheets of the bank that lost the money on them. They were tucked in SIVs, Structured Investment Vehicles, which the banks created to hold them. It was perfectly legal to do this even though the effect was to give a false sense of security to anyone looking at the balance sheet. Regulators accepted the structures. Yet when things went wrong, the banks had to bail out the SIV’s taking huge losses in the process. SIV’s are largely being wound up now. But whatever new regulations come along there will be a new way to get round them. There are similar problems with some other ideas for tightening up. Regulators say they don’t like the bonus system which pays people for the immediate profit they make. But the problems have come from a market where people create and sell securities. How are you going to keep track of a bond which has changed hands 50 times in the past 3 years to decide whether it was good enough to pay a bonus. What about the shareholders who received a dividend in the first year; would they have to pay that back and to whom? Some people blame the very existence of the bond market for the problem. There have been many attacks on “securitisation” (note 2) and calls for it to be severely curtailed. That would actually make the danger of a collapse even greater if loans go wrong. Central banks ducked the big question of how much risk should be allowed. They had a respectable argument. The economy needed the help of low interest rates, and apart from raising interest rates there was nothing the central banks could do without interfering in the market. That at least was the theory propounded by Alan Greenspan. It had two parts. Interest rates should be set for the economy as a whole( in which he was right). And only interest rates should be used by central banks, which should not interfere with the way the financial industry ran its business (in which he was wrong). No one, including Greenspan, denies that the financial markets in the past few years have shown a tendency to create bubbles, whether it be dot.com shares in the late 1990’s or major housing markets in this decade. But why should everybody else have to pay higher interest rates because of that? The final step down this particular section of the road to disaster came from the sheer inventiveness of the firms in the system. Old style banking was always grounded by the need to produce cash to pay for what you bought. But starting in commodities, the futures market gave the opportunity to buy large quantities of many assets for just a small deposit down. One of the reasons flying is so safe is that the industry takes any “near miss” very seriously. The incident has to be reported, studied and the lessons learned. The most dedicated believers in doing this are the pilots themselves, who stand to die with the passengers if something goes wrong. The world’s financial markets have just had a very near miss, coming within a few hours of what could have been melt-down. The most important change which has hopefully been made is that all sorts of financial institutions will try harder to make sure they know exactly what they are betting on. That will happen. Until next time the bubble comes back. David Blake is a financial analyst and commentator. Note 1: CPDO A debt instrument which took the investor’s cash, bought a bond which guaranteed the full amount to be repaid but which earns interest by taking bets which are leveraged 15 times in order to make them attractive enough. This meant that the bets could wipe out large parts of the capital leaving little to pay back. In spite of this, Moody’s gave them AAA ratings. They now say this was because of computer error. Note 2: Securitisation began as a defensive response to the banking crisis of the 1980’s when many US banks were effectively ruined by bad loans to Latin America. The answer was for banks to stop risking their own money and take a more arms length approach, turning loans into bonds which could be sold to ordinary investors. That way if things went wrong at least the banks would not be in danger. Since they are the one part of the economy which can bring everything down, as they did in the early 1930’s, the authorities were keen to encourage this trend towards making more finance available as bonds. The ideal buyer was described as the “Belgian Dentist,” notorious for their huge fees and their tax evasion through Luxembourg. (A very senior UK official said to me at the time “ I don’t know any Belgians and nobody likes dentists so they can lose as much as they like as far as I am concerned). In the late 1990’s this system seemed to work well to limit the damage from the dot com bubble. Huge quantities of bonds were issued which turned out to be valueless but the banks sailed blithely on. Why? That is exactly the question the Bank of England MPC asked Alan Greenspan when he came to London to pick up his knighthood. If the banks didn’t suffer who lost all the money? He smiled and said “European insurance companies”.